John Lubans is a retired research library adminstrator. A Fulbright Scholar twice over, he is a Visiting Professor at the University of Latvia where he teaches annually his class on “The Democratic Workplace”. Fables for Leaders follows his 2010 book, Leading from the Middle (ABC-Clio). He blogs weekly at blog.lubans.org. 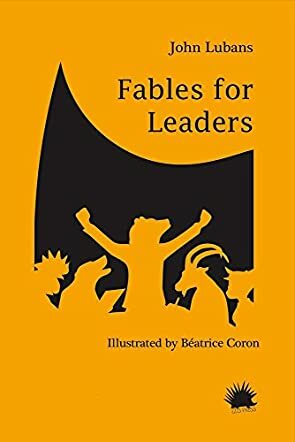 By nature I am a fan of fables, fairytales, and legends so when I came across John Lubans' Fables for Leaders, there was no way I could pass it by. The book is segmented into chapters which are then subdivided further. For example, in the chapter titled The Effective Follower, one of the sections is titled “Are You Leading or Am I Following?” and that subsection has three fables pertinent to that concept. The individual fables are further segmented by the retelling of the fable, followed by the accepted interpretation with an analysis of how the fable applies to modern business, and closes often with a tagline gleaned by the author. The organization of Fables for Leaders was creative and thoughtful. Beyond the organization, I loved the texture of the work. The illustrator is Beatrice Coron and her paper cut artwork is done black on white and it is intricately simple and elegant. The font used is calligraphic, which added to the “timeworn” feel. The whole experience of reading the fables made me want a roaring fire and a cozy nook. While Fables for Leaders is beautifully rendered and aesthetically pleasing, the real treasure is found in the hints of wisdom John Lubans reminds us of. We’ve all heard the tale of The Grasshopper and The Ant, certainly, where one saves for the winter and is prepared when bad weather comes, and the other who does not save for winter finds himself in dire straits because of it. What Lubans does, masterfully, is take the cliche and make it relevant for today, and readily applicable for persons in leadership roles. There is great wisdom within these pages and the amazing thing is that we all know it, but Lubans provides us with the next step to take this intrinsic knowledge, this long forgotten wisdom, and retool it for our current lives. He opens the door to us and explains how the fables we learned at our mother’s knee were training us to live a most productive life. I want John Lubans' book, Fables for Leaders, for my own personal collection, and I want it printed on parchment.